Alexa is a powerful tool for getting high level insight into any website. It can be used to research websites related to a specific topic and get some insight into what people do on those sites, where they come from, traffic estimates, etc. In this article I’ll cover some Alexa features and how those can be used. It only provides traffic rank of top level domain. To get an estimate of any subdomain, We may have to look at subdomain stats of that domain. Its not possible to estimate the traffic on a subdirectory using Alexa. Alexa top search queries is one of the most powerful features of Alexa. It gives us a good idea of what people are searching and what kind of content that site has. e.g. 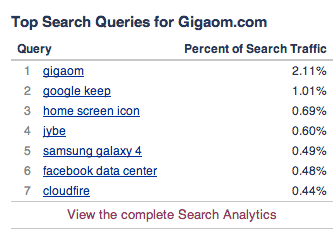 Here is top queries on gigaom.com at the time of writing this article. It only gives us some high level idea of what people are searching. The data is not comprehensive. So we should not draw any strong conclusion from it. Again the data is based on a sample of users who have Alexa toolbar. It may differ from real data significantly. Even though a site may serve to global audience but it can become more popular in specific countries because of various factors in that country. 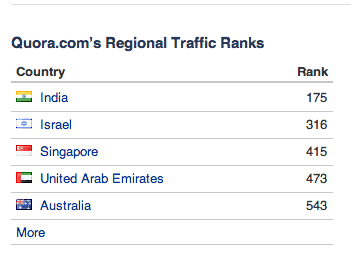 Quora seems to be more popular in India as Indians have more affinity for education and knowledge. Also since the traffic and physical infrastructure is bad in india, it is more tempting to contribute on the internet for Indians with improvements in broadband accessibility. Very powerful county and people insights can be drawn based on what sites are popular in what country and what sites not. Alexa can be used to compare traffic ranks of two sites. 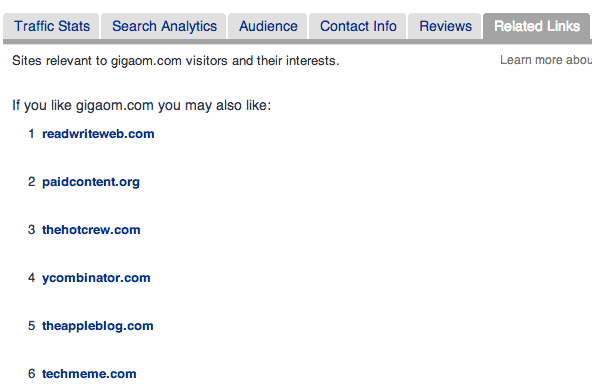 Here is how it looks for GigaOM and ReadWrite. The daily reach absolute value itself does not provide any meaningful information. But when we use it for comparison, it is pretty useful. It only compares top level domains. So if a site has multipel subdomains, the comparison may not provide any meaningful data. It is very approximate and based on users who have Alexa toolbar. But it still gives us some ballpark estimate of relative traffic ranks of various sites. If we know the actual traffic on one website (e.g. our own website using Google Analytics), we can estimate the traffic on other websites. This is again very approximate and not too reliable. But it is better than no estimate. Compare works little better for sites which have similar order of traffic. Comparing a very popular sites with not so popular site may not yield any meaningful result. Related links is pretty useful to discover new websites. We can start with one website and look at its related websites, then their related websites and so on. This is a good research tool. Click stream is pretty powerful tool. But this data is very approximate and should be used only for high level estimates. 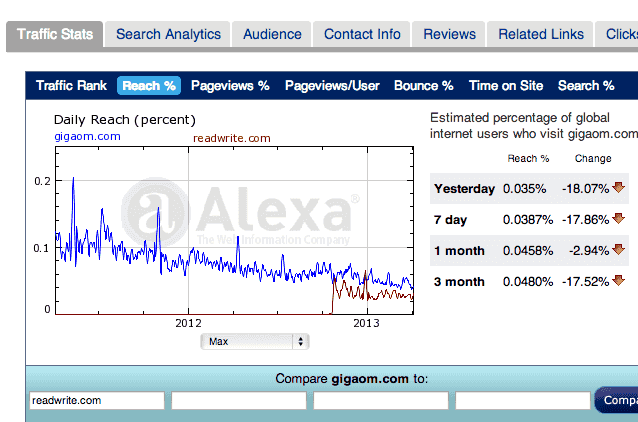 Alexa rank – how reliable is it?